…which is an understandable response when meeting a madman, a madman like the Butcher of Khardov! 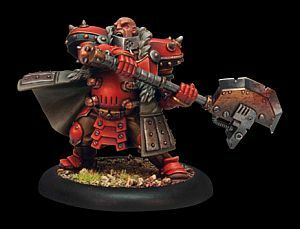 The first of the two Khador lists I am considering is led by the warcaster Orsus Zoktavir, the Butcher of Khardov–also known as the pButcher, or alternatively as OMG HE’S GOT A GIANT AXE AND IS COMING RIGHT AT ME (to his friends). As I noted elsewhere, I feel like the pButcher and his Full Throttle spell leverage the inherent fun to be found in fielding lots of great stompy, steamy magical robots, but I am concerned that his playstyle might be a little one-note in the long term, and he does not seem well-suited for scenario play. Now, this seems like a lot of fun. I like the fact that the War Dog and Iron Flesh combine to give ol’ Orsus a remarkable Defense stat (for Khador) in addition to his excellent Armor. I am not a fan of Beast-09 as a de rigeur auto-include–I’d rather explore some of the other options amongst Khador’s heavy iron, and that’s a lot of real-world cash to spend on one model (I frankly feel he’s inflated in price because of his perceived value on the table)–but Beast really makes sense for this list, both thematically and in his ability to draw fire away from Yuri and the Bears (individuals who are really not otherwise fit to be mentioned in polite company). I like that the Koldun Lord can add a Focus to a ‘Jack (making up for the fact that the Butcher really needs to spend focus on spells) as well as wield his magic shotgun. And the Widowmakers and their Marksman can soften up the enemy or deal with roaming solos while the Butcher trundles along upfield. Now we’re looking at 15 axes, enough to reduce any Circle Oroboros treehugger to singing folk songs about Nature and crying into their wheat grass. The loss of the Widowmakers pains me, partially because I love the models, partially because they seem to be some of the most generally useful Khador forces and are thus of high value, and partially because I am concerned about removing all long range attacks from the list. That said, the Greylord Ternion gives me cloud cover for the advance and more magic shotguns (and, of course, more axes); there seem to be a fair number of ways to see through clouds, but in general I feel like they add a valuable defensive screen. And the Manhunter brings more free-roving threat to keep my opponent distracted, an especially valuable feature in a low-model army. To be honest, the Manhunter could be swapped for any number of two-point utility solos, including the Widowmaker Marksman, Kell Bailoch, or Harlan Versh, for example. Every time I ponder either version of this list, I feel like the ‘Jacks are going to be a few tons of fun and it would be a great way to dig into play, without going too overboard on unusual rules or obscure synergies. A small number of models in the army helps me get to the table faster (as a slow painter), but also seems to limit some of my options for board positioning. I think it can really turn out some damage once in melee range, but the lack of a tar pit or a lot of ranged threat (in either version) forces me to play like…well…a madman! That is most assuredly going to hurt.